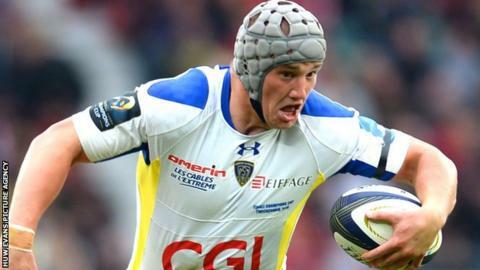 Wales centre Jonathan Davies will return to Scarlets from Clermont Auvergne on a dual deal with the Welsh Rugby Union. The British and Irish Lion, 27, left for France in 2014 and will return for the 2016-17 season. In a joint WRU-Scarlets statement, Davies said: "The time is right to return to Wales and signing a [dual contract] is the best decision for me." Davies has 48 Wales caps, but a knee injury ruled him out of the World Cup. Scarlets: Jake Ball, lock; Scott Williams, centre; Samson Lee, prop; Rhodri Jones, prop, Jonathan Davies, centre (from 2016-17). Davies left Scarlets to join Clermont Auvergne on a two-year contract before the 2014-15 season. He is expected to return for the French club during December. The WRU tweeted: "Welcome home Jon! @JonFoxDavies returns to Wales and @scarlets_rugby on National Dual Contract." WRU chief executive Martyn Phillips added: "His return demonstrates the value of the NDCs as a means of ensuring as many of the most talented players as possible play their rugby here in Wales. "Here in Wales our four regions are ambitious for success and the WRU will continue to work alongside them to achieve that." Scarlets chief executive Darran Phillips said the signing was "further evidence of our ambition to be competitive at the highest level". Davies was part of the Clermont side that lost to Toulon in the 2015 European Champions Cup final at Twickenham. A few weeks later Davies ruptured his anterior cruciate ligament, ruling him out of the World Cup. He is the 17th player to sign a dual contract, which give the WRU greater control over players in return for paying 60% of their wages. Former Wales dual-code wing Adrian Hadley says Davies' signing is "good for Scarlets and for Wales and Welsh rugby". "It's good to have players like Jonathan Davies playing within Wales, no shadow of a doubt," said Hadley. "But I would look at the younger players to actually dual-contract rather than actually spend money on players that have decided to play their rugby out of Wales out of their own choice, really."